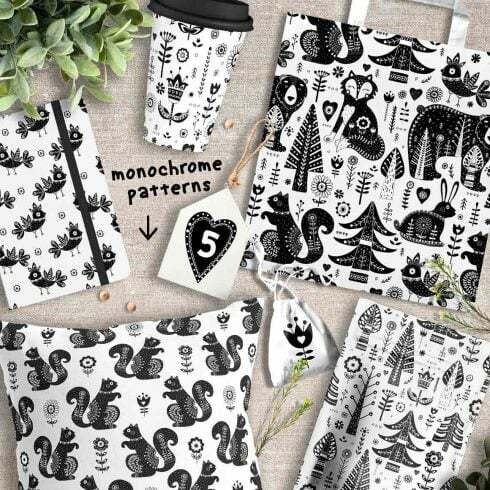 Scandy Forest Collection – $10 ONLY! Just share this page on social media! So what will you get? Use Photoshop to edit JPG and PNG files and Illustrator to edit EPS files. I hope you enjoy using this product. If you have any questions feel free to send me a message here. 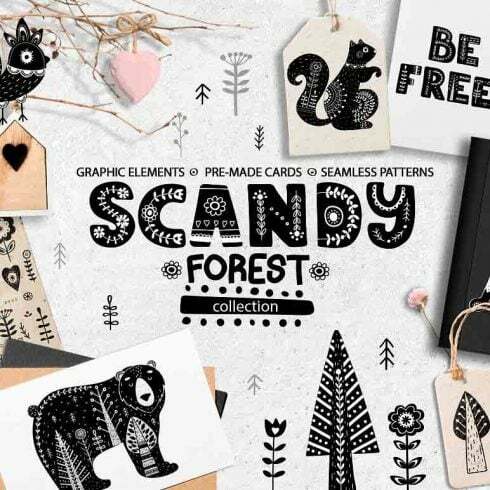 Video About Scandy Forest Collection – $10 ONLY! In general, textures are visual patterns that replicate a certain real-life material or finish. For example, we see plenty of craft paper and wood textures in various designs. Concrete, skin or rock ones are also in demand. Textures often are made up of patterns although they seem like they are natural and random. The application of texture vectors is not restricted to creating wallpapers, their qualities can be integrated into any layout component. With the addition of texture patterns, we can easily create an impression of some physical traits, form levels, and make highlights. A pattern can be seen as canvas that is made up of recurrent images. Web design patterns are most liked for being lightweight and adjustable to different screen resolutions. With the help of web design patterns, you can easily create exclusive bright backgrounds and highlight separate components. Numerous website developers select patterns over high quality images to create website backgrounds since they are incredibly diverse, eye-catching, and simple to work with. Pattern layouts help to create excellent and consistent designs. Using an elegant pattern or a sophisticated texture can totally change the overall look and feeling of any design. The costs of textures and patterns vary from $4 to $50 depending on their difficulty and originality. We have the most varied packages on MasterBundles.com. They differ in cost, so everyone will find something to suit their budget. The product bundle is really a kind of set or selection of items. They’re compiled to a single “package” and are marketed collectively, as a single solution. Sometimes, there’s some concept or objective which combines the items in a bundle, but that is not required. The time, while the bundle can be purchased, may be very limited (up to 5 days) and that’s why the price tag of it is below what those products would cost if marketed on their own. Bundles are very profitable and make it easy for developers to save quite a lot of money. Why textures and patterns are very important? If you wish to use a awesome and engaging layout that can impress the viewers – under no circumstances try to save on tools and components. High-quality textures or patterns can make any design rock, so stay clear of unprofessional products. Inadequate color options or low-resolution graphics could wreck the appearance of your project. Let’s say the bundle does not include all the products I want? Not every product bundle carries design elements you want which is really common. Bundles are created for different purposes . Nonetheless, MasterBundles site provides a large number of deals for virtually every occasion, so in the case a specific product bundle doesn’t contain all the items you want – you should check the others. There are so many of these, that it’s almost sure you will discover something suitable. Can I acquire any other packages on MasterBundles? On top of font bundles, our website boasts numerous other spectacular design bundles. Take a look at web template bundles, image bundles, icons, textures, and patterns. There are also e-books and courses, stock photos, logo designs, illustrations and add-ons, mockups, as well as other categories. You’ll find thematic X-mas and Valentine’s deals, postcards and powerpoint presentations. And, obviously, our most popular under $5 design bundles! MasterBundles.com is an internet marketplace. On our website, pro web designers offer for sale their designs at the best prices. We provide you with the very best deals out there, and our deals are well praised by customers. Visit our blog, it is filled with useful and motivating material for pro designers. Also, for those who subscribe to our newsletter, you’ll be the first to find out about our discounts. And we absolutely love discounts. There will always be discount coupons and promo codes available to lower the prices to a minimum. What exactly is a Scandy Forest Collection deal? If you are a graphic artist working on several assignments simultaneously, you, like no others, see the need for the entire bunch of design items available at hand. Trying to find them one at a time, you spend whole lot more cash and time as a result. To obtain all the essential elements within a single package, we highly recommend taking a closer look at graphic deals. A bundle is actually a collection of elements needed for graphic design, priced at thousands of dollars, yet sold at a discounted price tag for a very limited time. Considering that all of the bundle deals differ from one to another, every web designer will find the appropriate selection for a unique venture. Researching them you will uncover the collections including UI kits, illustration swatches, business cards, social media infographics, plus much more. On MasterBundles marketplace, you can find more than 450 graphic bundle deals to choose from. That being said, you’ll not have even an opportunity to leave the website empty-handed. For what reason are Scandy Forest Collection highly profitable? The benefits of graphic bundle deals for designers are usually pretty evident. However if you are a newcomer to them and now have concerns, the subsequent info will be of great help for you. Including a multitude of the elements in a single package, the collection gives you a chance to use different of them for many different projects. On top of that, the price is often cut down tremendously which lets you stretch your budget, yet receive the entire set priced at hundreds of dollars. Precisely what is infographics bundle? Articles on blogs which contain infographics are much more readable and favored than those that don’t. A specialized bundle for infographics is convenient because it offers an almost ready-made solution. The web designer only has to combine the images and voila! The infographic is ready. In the digital and online era, all of us devote practically half of our lives within social media networks like Instagram. Regardless of what objective we try to achieve using this platform, we need to stick out in a crowd among thousands of identical profiles. With top quality Instagram design templates sold at MasterBundles.com, you don’t need to devote eternity while building the outstanding appearance of your Instagram page. One of many bundles will surely help you highlight the visual look of your Instagram page. Exactly what are photo tools deals? The graphic designers who choose to do business with photos are going to be particularly excited about the photo overlays graphic packages. They consist of collections of elements of design that could enhance and customize the photographs. This kind of graphic components is frequently placed over the photos to produce some new look. The definition of a watercolor graphics package deal? The watercolor bundle is considered to be the most beautiful innovation in design. Brushed by artists on the a piece of paper, the images become scanned and added in a package deal as templates for projects. Watercolor components are ideal for posters, DIY and wedding invitations. Great deals will be on their way to your mailbox soon. Server error! Please, try again later.